This quick and easy salad can be prepared ahead of time and will last a couple of days in the fridge. It’s gluten free, low calories and a good source of protein. The salad can consist of any vegetable you have in the fridge – it’s the dressing and herbs that pull it all together. To make dressing place the sweetener, water , white vinegar and fish sauce in a sauce pan and bring to the boil, then take off heat, add the chilli, taste and adjust if needed ( it will be sweet). Place in fridge to cool. Combine the cooked noodles, carrot, cucumber, capsicum and spring onion in a bowl and set aside. Shred or slice your chicken, combine with the noodle salad, add a little of the dressing at a time ( about 1/4 cup) toss and taste. 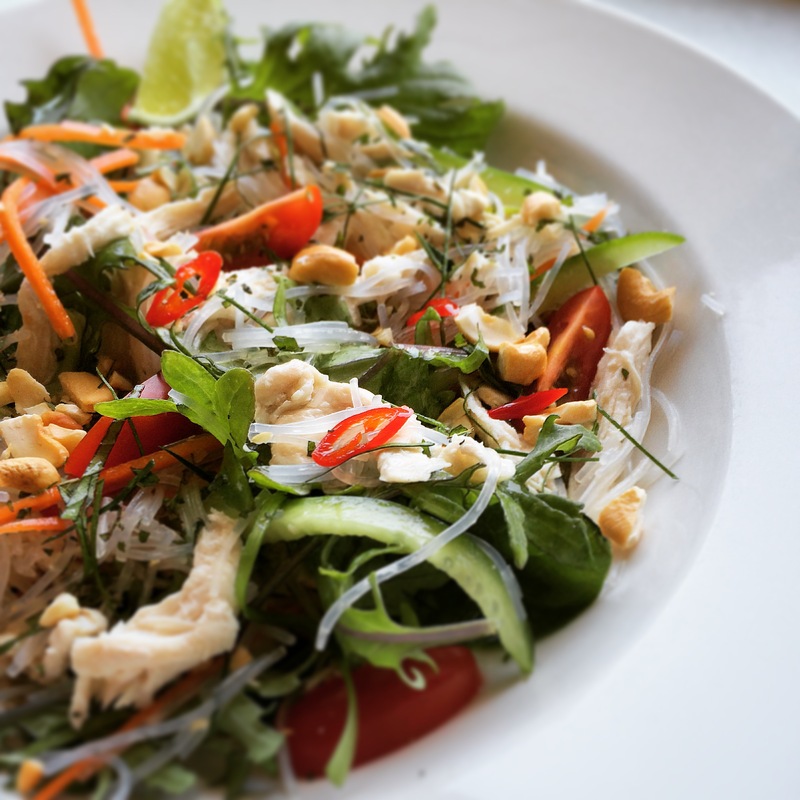 Assemble salad in a bowls, garnish with the fresh herbs, nuts and extra chilli and wedges of lime. Ive made this salad before with pork belly, thai chicken cakes, salt and pepper calamari and bbq prawns, its such an adaptable salad. It looks delicious and so healthy too!